Featuring live music and children’s activities. Bring a picnic lunch or buy one in the park. Enjoy the sunshine with your children, friends and co-workers! It has since grown into one of the community’s most popular events. Each concert serves as a meeting place and opportunity for community groups, business people, friends, families, seniors, and preschoolers to gather together and enjoy music, downtown Fredericksburg, and each other. Fredericksburg Parks, Recreation & Events hosts this FREE concert series made possible by our wonderful sponsors!! It’s a great opportunity for visitors and residents to savor a beautiful day outdoors in historic downtown while enjoying live, local entertainment. 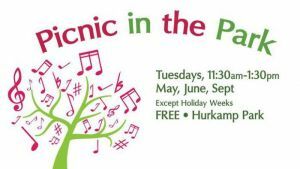 Bring a picnic lunch, a blanket, and come relax with the kiddos. Questions or to sponsor this event, call 540-372-1086 ext. 307.